Having scaled the fifth and fourth highest mountain on earth, without bottled oxygen and a High-Altitude Sherpa by his side – the spring season in Nepal went like clockwork for the German climber Thomas Lämmle. 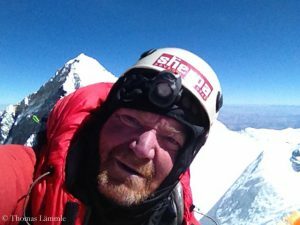 The 52-year-old from the town of Waldburg in Baden-Württemberg summited the 8,485-meter-high Makalu on 13 May. Only eight days later, on 21 May, Thomas stood on top of the 8,516-meter-high Lhotse, in the immediate vicinity of Mount Everest. Lämmle has now scaled seven eight-thousanders after Cho Oyu (in 2003), Gasherbrum II (in 2005 and 2013), Manaslu (in 2008), Shishapangma (in 2013) and Mount Everest (in 2016). I asked him about his experiences. 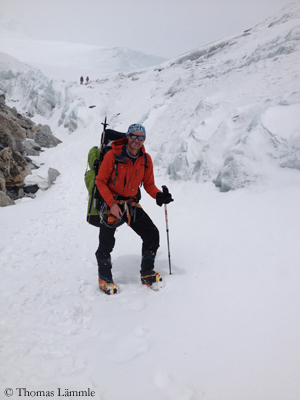 Thomas, last year your four summit attempts on Makalu failed due to bad weather. How have you been during your successful summit bid this spring? Last year’s failure was virtually the prerequisite for success this year. Last year I started four times from Makalu La (7,500 m) towards the summit. I had to do the trail-breaking by myself during all four summit pushes and was mostly alone en route. The biggest problem was the changing weather and snowfall, which hindered the ascent. Despite all the capricious weather, I reached an altitude of 8,250 meters. However, I realized that with the 2017 tactic, Makalu could not be climbed alone and without oxygen. The Advanced Base Camp (ABC) is located at 5,700 meters, too high for real regeneration. The way from Camp 3 to the summit is too long. Moreover, you reach the Camp too late to prepare properly for the summit. This is only possible from Camp 4. 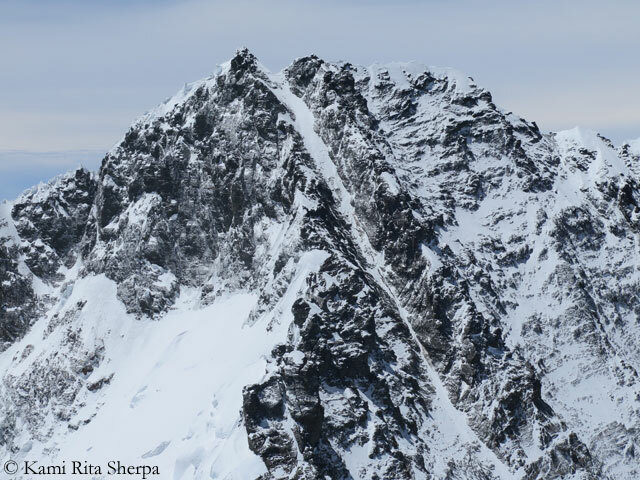 Based on my experiences from 2017 and my knowledge from 25 years of research in high altitude physiology, I prepared a detailed ascent plan for Makalu. And it worked! Already in March, I trained and pre-acclimatized on Kilimanjaro. On 10 April, I arrived in Nepal. On 23 April, I reached the ABC on Makalu for the first time. 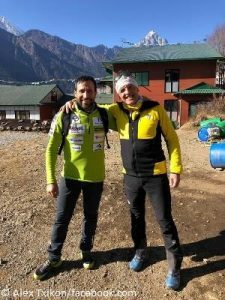 After setting up Camp 2 (6,600 m) and Camp 3 (7,500 m) in the following days and staying overnight in Camp 3 on 3 May, I descended to 4,400 meters for regeneration, to a yak-alp in Langmale. There I waited until (the Austrian meteorologist) Karl Gabl informed me about a good weather window: Summit day should be on 12 May, but with stormy days ahead, he said. On 7 May, I set off for my ascent and finally reached Camp 3 on Makalu La on 10 May. Unfortunately Karl had made a mistake of one day, so that I was stuck in the storm for three days. 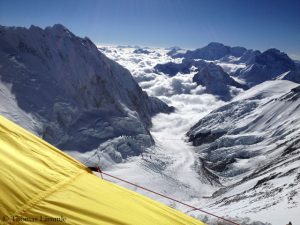 In the afternoon of 12 May, however, the storm calmed down and I was able to move my tent to Camp 4 (7,600 m). The following night, I set off at 1 am for the summit bid. I was the only climber on Makalu La at that time. Because of the storm, no one had been able to climb up to the pass. A beautiful, windless day lay before me. Unfortunately there were no fixed ropes above Camp 4 at first, which I could follow. So I used my last year’s GPS track and after some searching I reached the fixed ropes in the steep terrain towards the summit. At 3 pm, after 14 hours of ascent, I reached the main summit with the prayer flags. Five hours later I was back in Camp 4. On the descent, I met numerous Sherpas with clients who were all using bottled oxygen. Eight days after that success, you stood on top of Lhotse, the fourth highest mountain on earth. 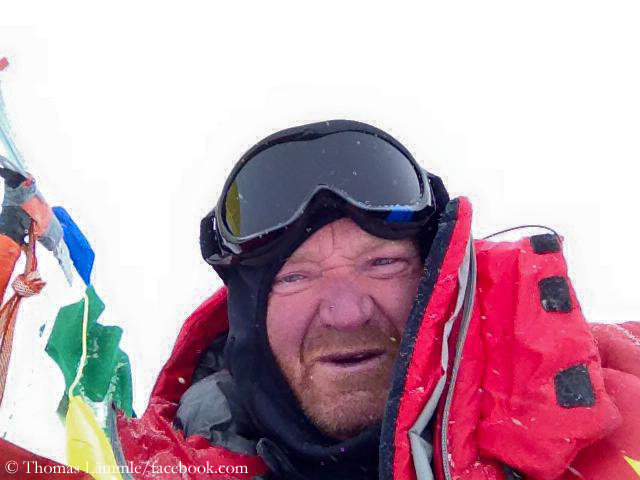 Was that rather easy compared to Makalu or did you have to toil the same way? On 16 May, I reached Everest Base Camp. I was shocked by the crowds and the helicopter noise. I just wanted to get away. I descended to Lobuche (4,900 m) to regenerate in a lodge. Actually I wanted to stand on top of Lhotse on 23 May. 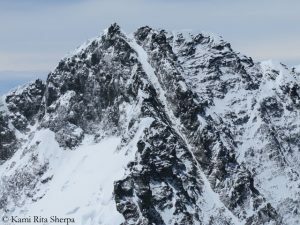 However, Karl Gabl predicted heavy snowfall after 22 May and advised me to wait for this precipitation period and only then to start a summit attempt. I was uncomfortable with this thought, perhaps the snowfall was already the harbinger of the monsoon. So I choose a “slap bang” action to reach the summit before 22 May. On the morning of 18 May, I returned to Everest Base Camp, packed my things and entered the Khumbu Icefall at 3 am the following night. Twelve hours later I reached Camp 3 in the Lhotse Face, where I spent the next night. 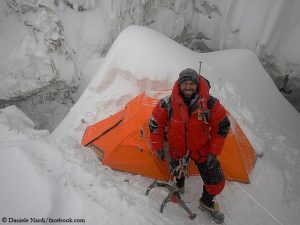 On 20 May I ascended to Camp 4 at 7,700 meters. From there I started at 11.30 pm towards the summit. 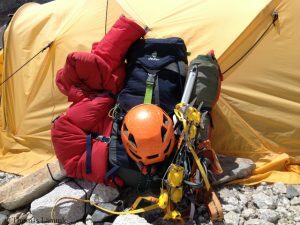 Shortly behind the tents the fixed ropes started, which led me to the Lhotse Couloir. I had been warned several times of this couloir, which is only two meters wide in some places. The danger of being hit there by stones or ice is immense. However not on 21 May – the Lhotse Couloir was filled up with hard snow along its entire length. 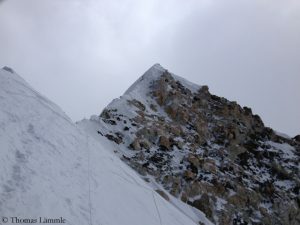 There was no rope team in front of me, so I could climb up the couloir comfortably and relaxed. I had a very macabre meeting just below the summit: The mummified corpse of a Russian climber is sitting there, over which you have to climb. At 8.30 am, I reached the top of the summit cornice. It was windless and I had a wonderful view over Makalu to Kangchenjunga. Afterwards I was able to abseil down the fixed ropes very quickly and already two hours later I stood in front of my tent in Camp 4. Two eight-thousanders within a week without bottled oxygen – that demands a lot from the body and the psyche. What does it look like inside you after your return to Germany? It may sound astonishing, but with my acclimatization tactics and the breathing technique I developed, Makalu was easy to climb this year. Due to the ascent from 4,400 meters and the following fast descent, my performance loss was relatively low. So I went to Lhotse very well acclimatized and hardly weakened. There the conditions were extremely good: a stable high pressure area with correspondingly high oxygen partial pressure, plus super conditions in the Lhotse Couloir. The ascent of Lhotse felt very easy and very relaxed. If I had had the money for an Everest permit, I probably would have climbed Everest as well. Of course, I am very happy to have scaled two relatively challenging eight-thousanders “by fair means” – my number six and seven. Anything but appetizing pictures from the Everest high camps have rekindled the debate on the waste problem on the eight-thousanders. How did you experience the situation? Unlike Everest, there is no “waste concept” for Makalu. At the end of the season, the ABC on Makalu is like a burning landfill site: all the waste is collected, poured with kerosene and lit. The ABC looks like that. Waste from the high camps is not transported away and is usually sunk into crevasses. However, there is far less climbing activity on Makalu than on Everest, so pollution is limited and concentrated in relatively small areas. Things are a little different on Everest and Lhotse. There we have about 2,000 clients and Sherpas in the high season. Waste management works quite well in Base Camp and Camps 1 and 2 – where no oxygen has to be used to move around or transport waste. 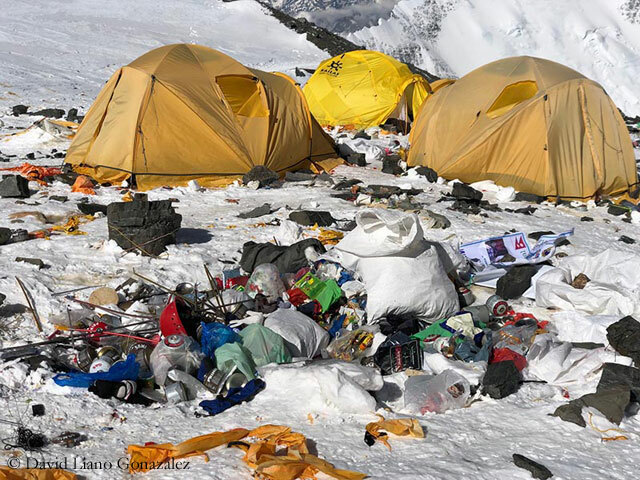 Especially the South Col (Camp 4), on the other hand, resembles a large garbage dump at the end of the season, because there oxygen would be required to remove the garbage. Of course, these costs are avoided. The National Park administration doesn’t check it at that high altitude. It looks a bit better in Camp 3, even though most of the rubbish is not removed, but disappears into crevasses. 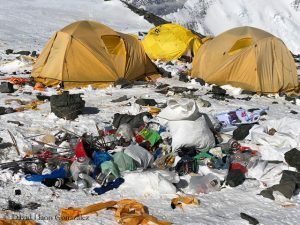 For me personally, a far bigger problem than the garbage on the South Col is the helicopter noise in the whole Solu Khumbu. On sunny days, Everest Base Camp is like a major airport. Every five to ten minutes a helicopter takes off or lands. The noise is sometimes unbearable and doesn’t even fit into Everest National Park. According to a helicopter pilot, there are now 38 helicopters in Nepal, which are mainly used in Solu Khumbu for tourist flights and so-called “rescue flights”. A nice example of this was the members of a Chinese expedition who flew from Base Camp to their hotel in Kathmandu because of bad weather prospects. 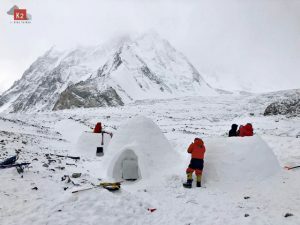 One week later, after a better weather forecast, they flew back and climbed the mountain with personal Sherpa and bottled oxygen above Camp 2.